Such generation is quite rare and is a certain miracle for players surviving in difficult conditions. 5 biomes are located in this place, and you will appear practically in their center. 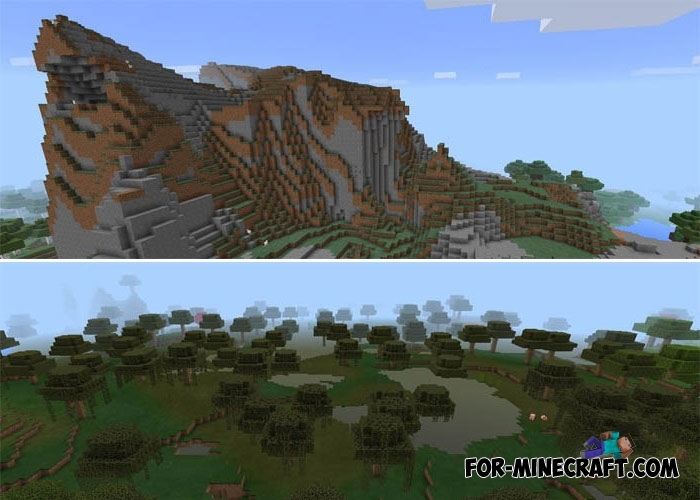 Looking to the left you will see a swamp, on the right is a huge field, if you need a forest, then it is in front of you and behind you is a picturesque ocean with new aquatic features available in Minecraft 1.5 and 1.4. As you know, every single biome is an excellent rare blocks source. Settled in one of the biomes and start a new life among the untouched world in MCBE. RockTheBiome seed for Minecraft Pocket EditionThis seed includes a variety of biomes, that will help in the implementation of your projects or simply for survival..